Its Monday morning and we are going to haulout Tuesday. We are getting the day planned to do all the last minute things we need to do. It is 9:00 am and Nina says, Jeanne just called and can Gypsy get hauled this morning? 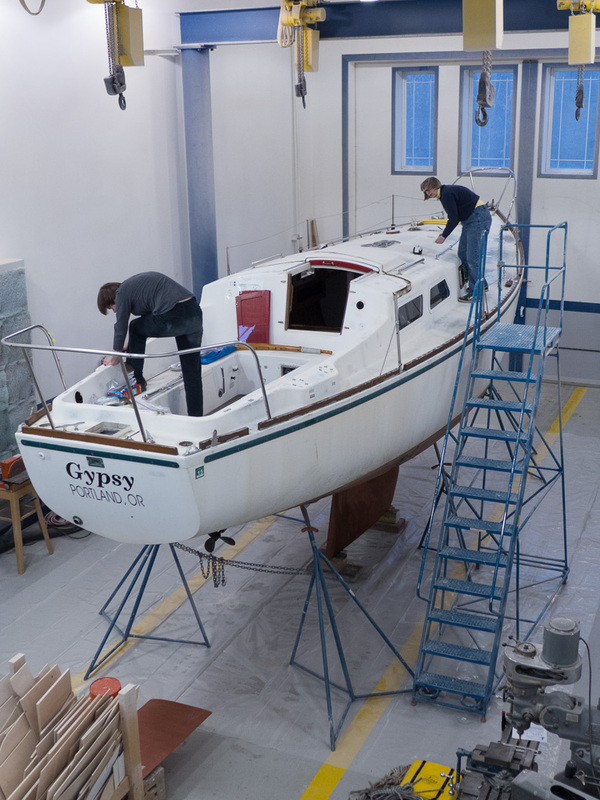 The schedule just moved up a day, but we have been waiting so long to get this done that we say sure, we can have Gypsy at the boat yard by 10:30. We are librarians, we don’t mess around! 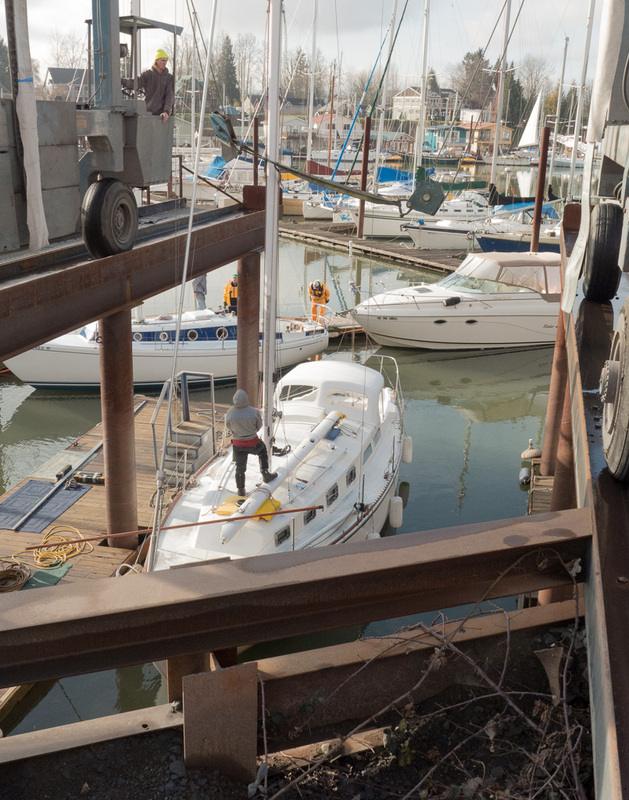 We jumped in the cars and headed to Danish Marine to drop off a car and then to Rose City Yacht Club to get Gypsy. Empty boat, on the way down river. In the lift at Danish. James is driving the lift and Cedric is on deck. 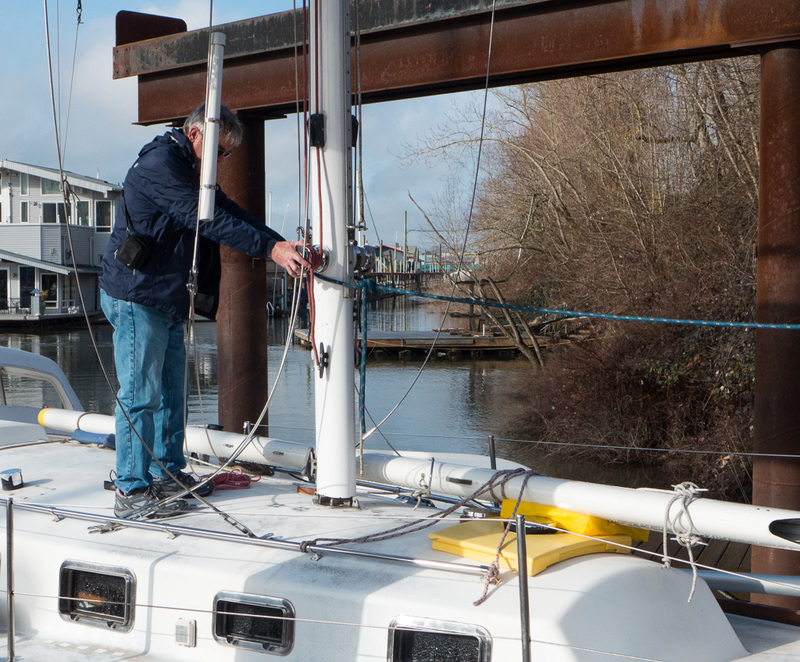 Bill is laying on hands hoping the mast will ascend. 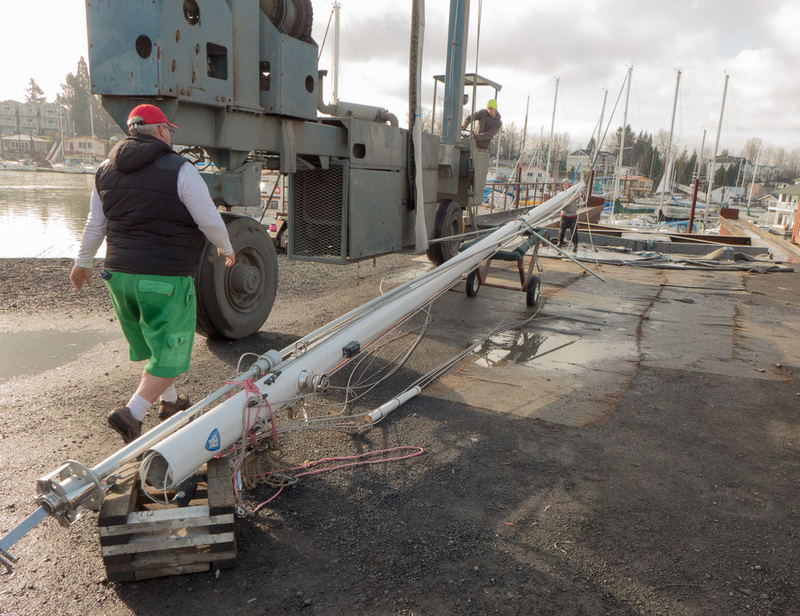 It worked, the mast is on the cart. Now it is Gypsy’s turn. I can fly! (just ignore my scummy bottom). 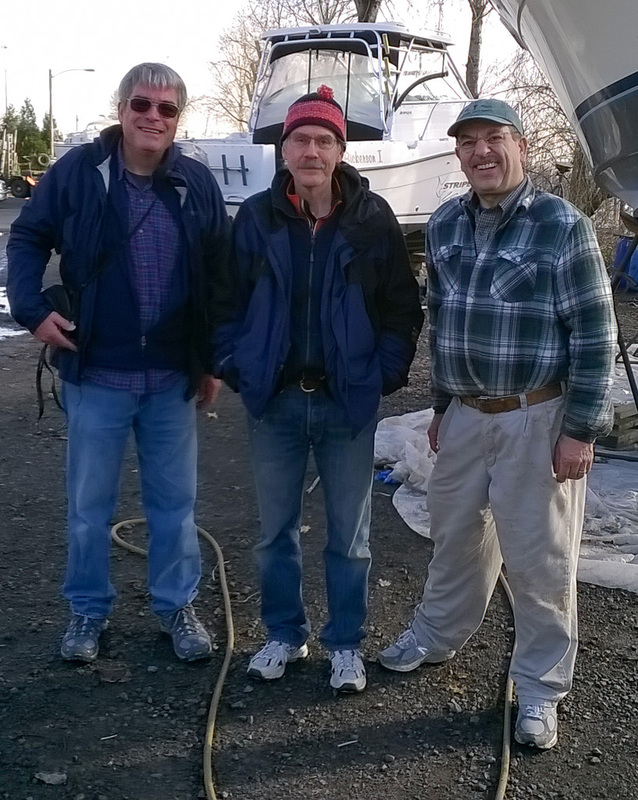 Bill and Nina say a very big thank you to Randy and Richard for helping to get the mast ready for the truck. 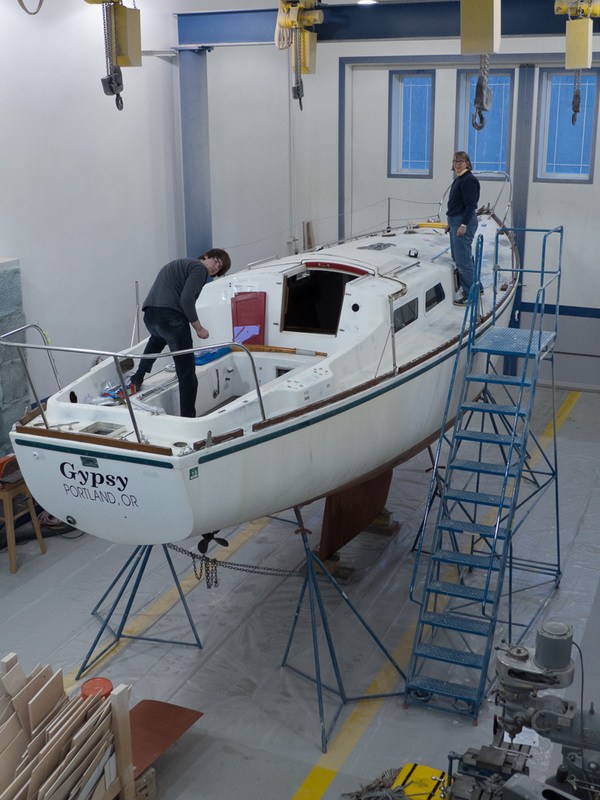 Gypsy and her mast are on the truck and ready to go. 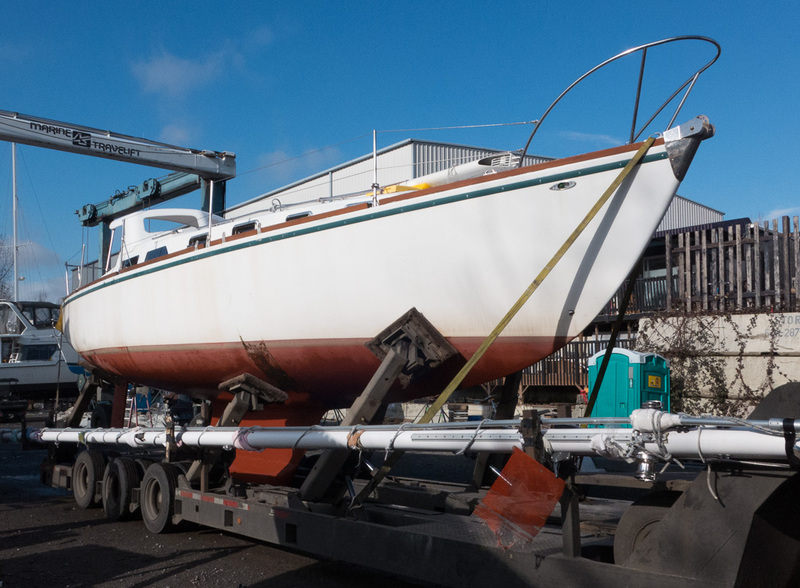 Thanks to Tim from Norgard Kirkpatrick’s Boat Hauling for getting Gypsy safely to Becker Enterprises. In Becker’s shop, Nina and Marsden are hard at work. Oh oh, they saw the camera. Dante needs to add grinding bottom paint to the Inferno. We bought Gypsy in the fall of 2003. 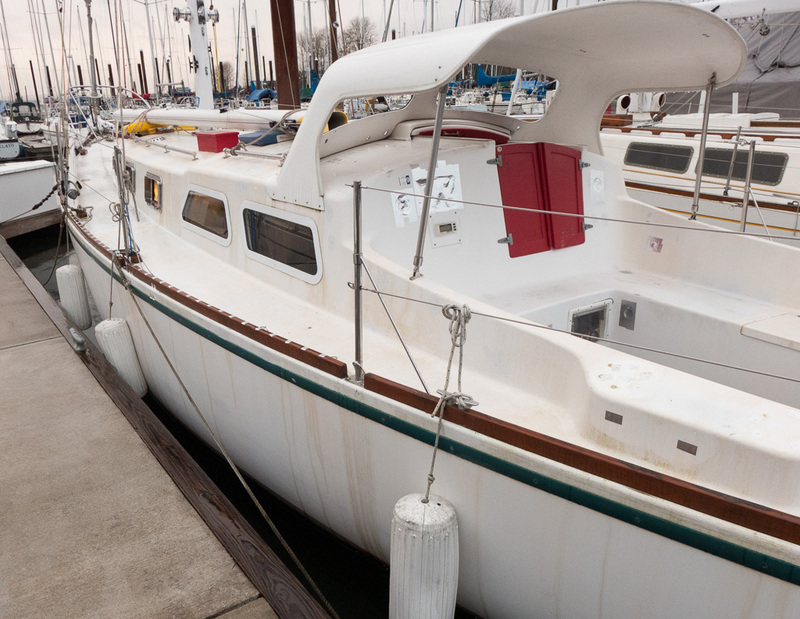 She is a great sailboat, but she is now 41 years old and she needs an overhaul. We want to make some changes to the cockpit and cabin. We will also address structural as well as cosmetic repairs that are needed. 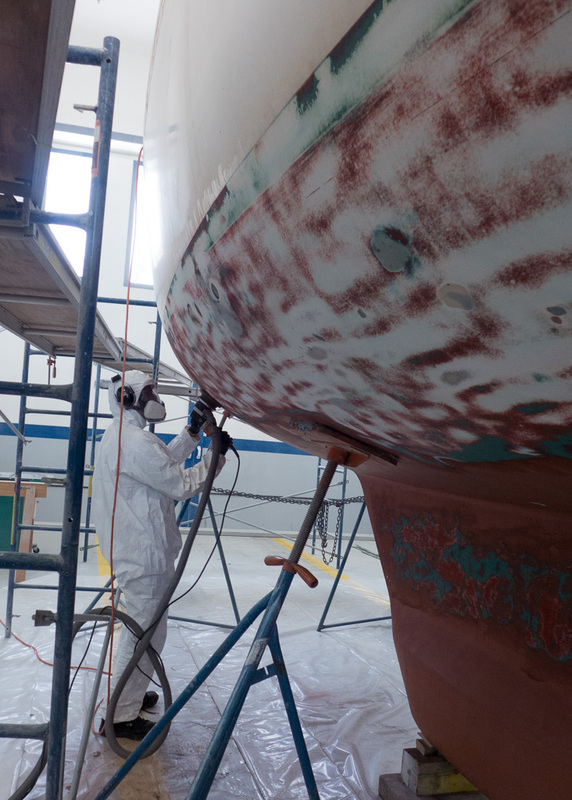 We want to sail her for a long time yet and these repairs and improvements will make that possible. 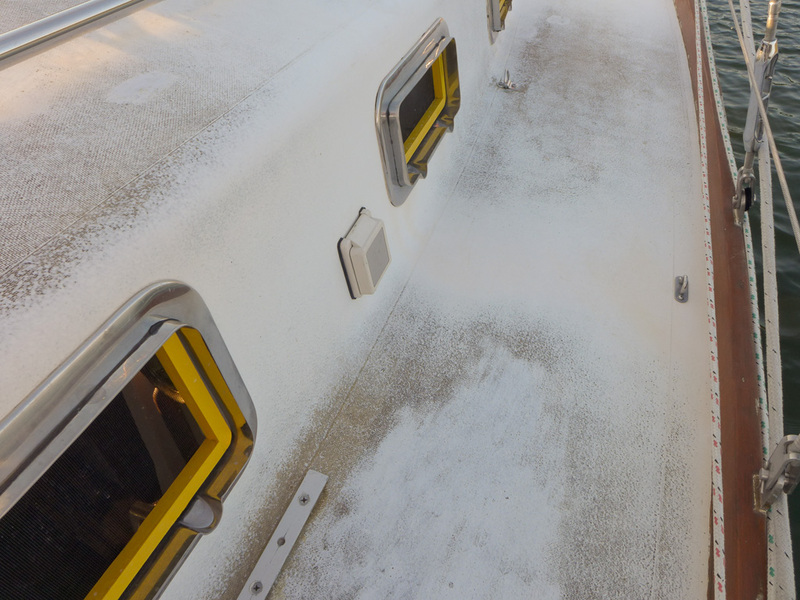 You can see that the gelcoat is worn away. Gypsy will look great once she is painted. 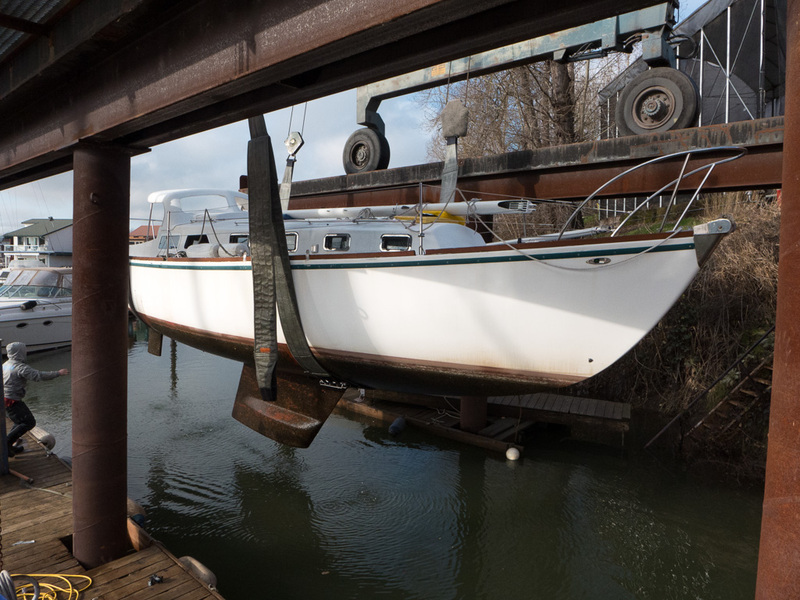 We have been busy getting as much prep done as we could before she goes to the boat yard. 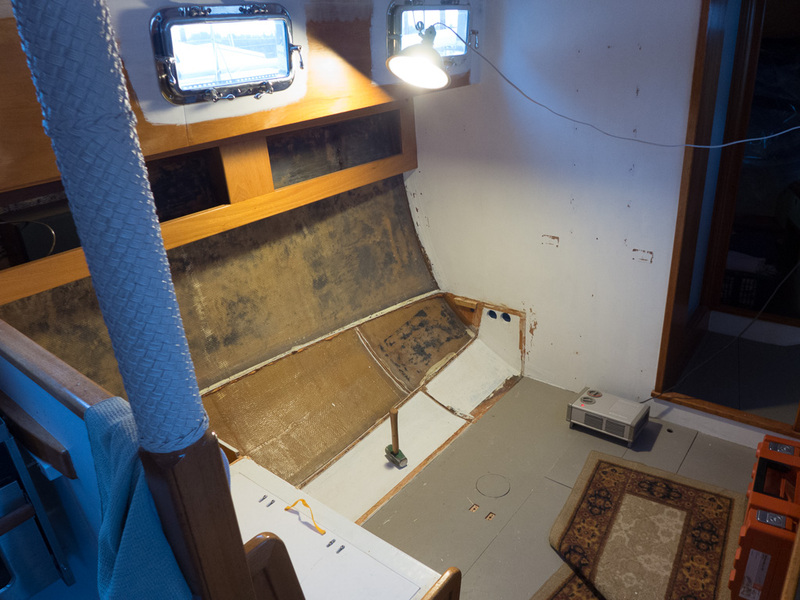 Most of the deck hardware is off and the cabin is stripped. We also have done some demolition in the cabin where we will be making changes to the layout. 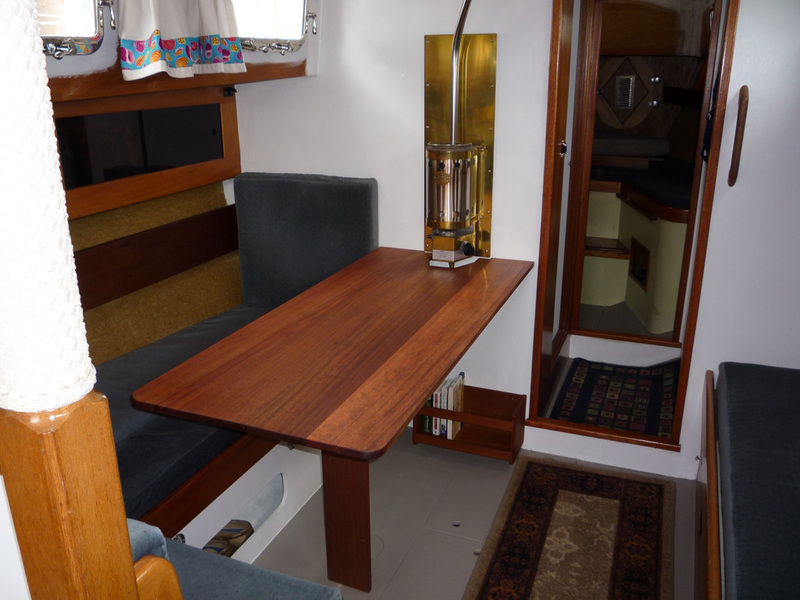 When she was built, four colors of carpet were glued to the hull to cover up the fiberglass. That has been removed and we are going find a better solution. 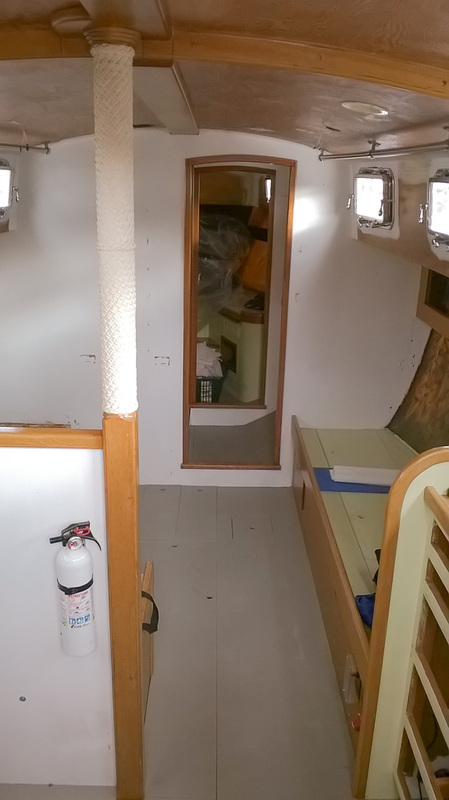 Here are before and after pictures of the cabin. 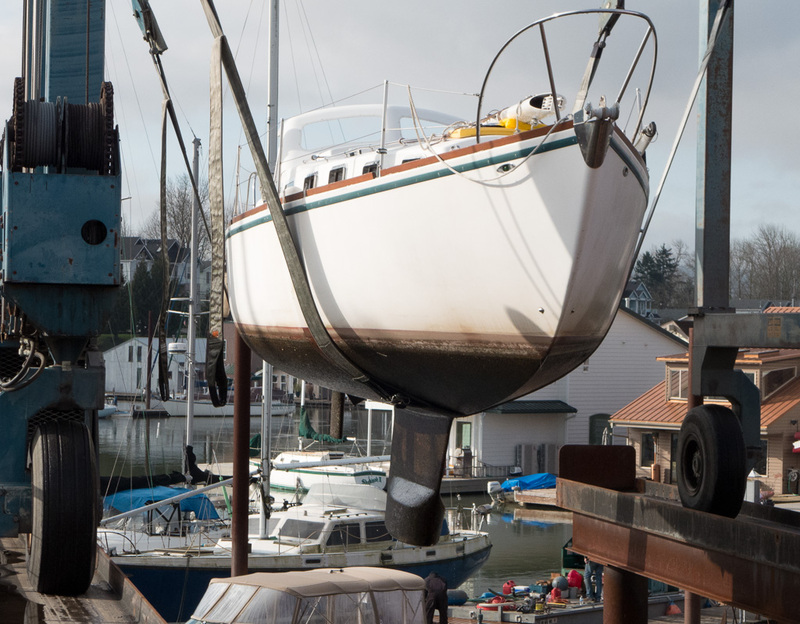 Ready to go to the boatyard. The silver tape is covering all the holes.